You may occasionally be asked in mid-service to show a song, Bible reading or other item which is in the Library but not in the service plan. 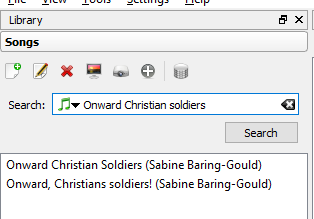 For a song, go to the Library, and click on the Songs bar. Type the first few words of the title into the Search: box. and click on Search Right-click on the item in the results and select Live to send it to the screen, or perhaps more cautiously select Preview to show it in the Preview panel - and it it looks good then click the projector symbol above the preview pane to make it live. For a Bible reading, go to the Library and click on the Bibles bar. 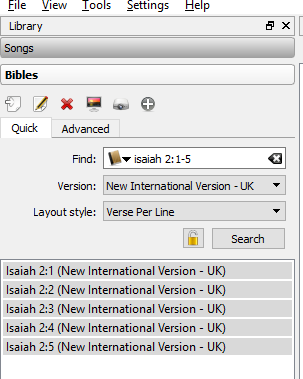 Enter the book, chapter and verse (eg Isaiah 2:1-5) in the Find: box and click on Search. Click the projector symbol under 'Bibles' to send it to the screen.